Rebuild of Evangelion is a theatrical animation series about the　trials and tribulations of the children who pilot the giant, humanoid EVA weapons. As Tokyo-3, their base of operations and last line of defense against human extinction, is invaded time and time again Blythe mysterious and destructive Angels, the children's fragile minds and sense of self-worth is called into question. For this collaboration, Ayanami Rei, with her trademark red eyes and light blue hair, will be collaborating with Blythe for the first time. into Blythe's form! She's a real doll, but don't tell her that! 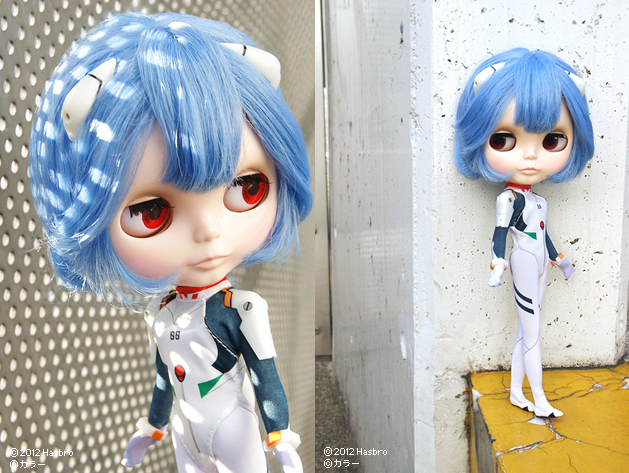 The CWC Exclusive Neo Blythe "Ayanami Rei Meets Blythe" is an arrangement of the Ayanami Rei EVA Unit 00 plug suit. 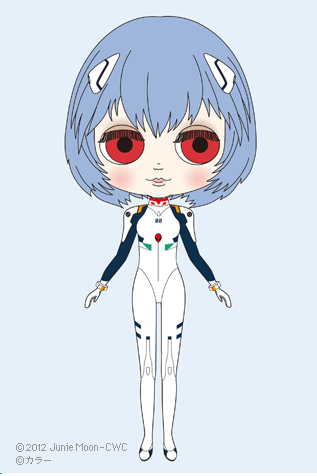 make-up have been considered to fully realize the "Ayanami Rei Blythe." Her hairstyle is a shagged bob with a subtle curl, with her bangs thin and long to recreate Rei's unique visage. Her hair color is a newly introduced light blue. The eye chips have been consolidated into a range of reds, including a new shade! Her eyeshadow and eyelid color is brown, with a specially created eyelashes, and a soft pink color is used for her cheeks and lips. Her face color is snow, and her face type is radiance. The illustration is a design of concept and does not reflect the final product.